The Absolutely Everything Package contains all you need to look great and feel great! 2 month supply of our Collagen AM formula taken on an empty stomach first thing in the morning. 2 month supply of our Collagen PM formula taken right before going to bed on an empty stomach. 2 month supply of our C.L.A. supplement taken before meals helps to work with the collagen protein and target the mid-section (tummy area) of the body. A 2 ounce bottle of Liquid Vitamin B12complex which helps to increase energy levels gently and naturally without stimulants. A set of Detox pads which is a great way to kick off the weight loss process by detoxifying the body of it's impurities. A handy pill box for transporting the C.L.A. supplement with you wherever you go. A Fast Food Eating Guide that contains the supplement facts of many major fast food establishments across the country, this will aide you in choosing healthier alternatives when visiting these establishments. A tape measure and measurement guide to keep you focused and on track. So glad I decided to try these products! I have been taking them for 3 weeks and have lost 2.5 inches off my waist, 2 inches off my hips and I had to tighten my belt up! I\'ve also lost 5 pounds and feel so much better already. 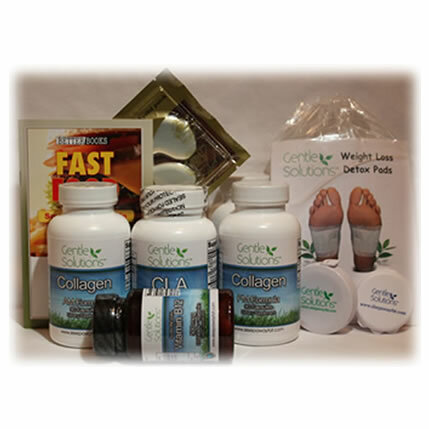 I\'m amazed at the energy I have now, very pleased with these products.